We have all the parts you need to build your next computer! We have all the parts you need! Whether you need some new RAM or are building a computer from scratch, we have everything you need to get the job done! Best selection of cables at the best price! 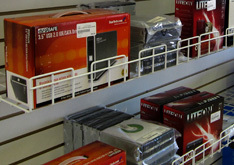 We carry a wide array of cables at half the price of retail! Can't find what you're looking for? We can order it! Unlike the big box stores we can order almost any part that you need. Plus shipping is free to our store!